A war not only arises, but derives its nature, from the political ideas, the moral sentiments, and the international relations obtaining at the moment when it breaks out. This amounts to saying : try and know why and with the help of what you are going to act; then you will find out how to act. In war there are none but particular cases; everything has there an individual nature; nothing ever repeats itself. In the first place, the data of a military problem are but seldom certain; they are never final. Everything is in a constant state of change and reshaping. This is not a peace treaty, it is an armistice for twenty years. My center is giving way, my right is pushed back, situation excellent, I am attacking. What you did was the greatest thing accomplished by any private soldier of all of the armies of Europe. The truth is, no study is possible on the battle-field; one does there simply what one can in order to apply what one knows. Therefore, in order to do even a little, one has already to know a great deal and to know it well. An army is to a chief what a sword is to a soldier. It is only worth anything in so far as it receives from him a certain impulsion (direction and vigour). Every manoeuvre must be the development of a scheme; it must aim at a goal. To inform, and, therefore to reconnoitre, this is the first and constant duty of the advanced guard. Men called to the conduct of troops should prepare themselves to deal with cases more and more varied upon an ever-increasing horizon of experience. They can only be given the capacity to arrive at a prompt and judicious position by developing in them through study their power of analysis and of synthesis; that is, of conclusion in a purely objective sense, conclusion upon problems which have been actually lived and taken from real history. Thus also can they be founded through the conviction that comes from knowledge in a confidence sufficient to enable them to take such decisions upon the field of action. Against what should fire be opened? Against the obstacles which may delay the march of infantry. The first obstacle is the enemy gun. It will be the first objective assigned to artillery masses. 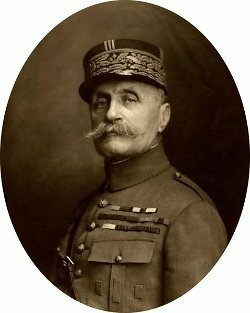 Bio: Marshal Ferdinand Jean Marie Foch was a French general and Marshal of France, Great Britain and Poland, a military theorist and the Allied titled Généralissime during the First World War.